Chihuahua dog breed information profile includes history, appearance, size, temperament, lifespan, health, training of Chihuahua dogs and puppies. 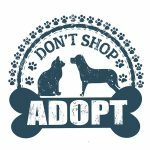 Thinking about adding a Chihuahua dog or puppy to your family? 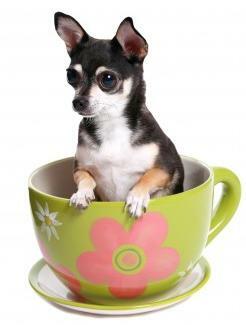 The Chihuahua is the smallest breed of dog, although its’ personality is anything but pint-sized. As many Chihuahua owners will attest, every Chihuahua is an alpha-dog. 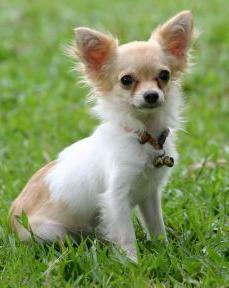 The Chihuahua has a clouded history and although an old breed, they are relatively new to the United States and Canada. The Chihuahua is a saucy, devoted pet that needs lots of love but only a few other requirements. 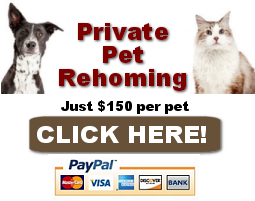 Exercise and grooming are minimal, but feeding his temperamental palate can be a headache. This tiny dog is well suited for apartment dwellers and ideal for the elderly. 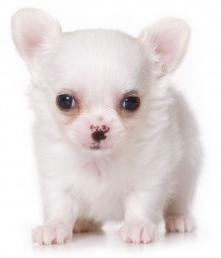 The Chihuahua’s distinctive features and bubbly personality make this small-scale pet a prodigious companion. The Chihuahua /tʃɪˈwɑːwɑː/ is the smallest breed of dog and is named for the state of Chihuahua in Mexico. Chihuahuas come in a wide variety of sizes, head shapes, colors, and coat lengths. The exact history of the Chihuahua is mostly unclear. Many historians believe that the Chihuahua is a descendent from an ancient breed called the Techichi which was kept by the Aztecs. Others contend that the Chihuahua was brought to North America by Spanish traders and was crossed with other unknown breeds. Still other experts claim that the Chihuahua is a descendant of a small, hairless dog from China, that crossed the land bridge spanning the Bering Strait and later mixed with the Techichi. What is known with certainty is that three tiny Chihuahuas were found in 1850 in Chihuahua, Mexico – hence the name, and were brought to the United States. Since that time, this diminutive, spirited dog has seen a meteoric rise in popularity and has become a favourite of families and celebrities alike. There are two varieties of Chihuahua; the Smooth Haired Chihuahua and the Longhaired Chihuahua. 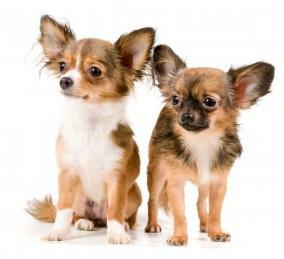 Both the Longhaired Chihuahua and the Smooth Haired Chihuahua are very small and compact dogs that are slightly longer than they are tall. The head of the Chihuahua is rounded, sometimes described as apple shaped, and the large ears stand erect and point slightly outward. The Chihuahua’s eyes are wide set, coal black and round and its tail is moderately long and will curl upward and over the back. 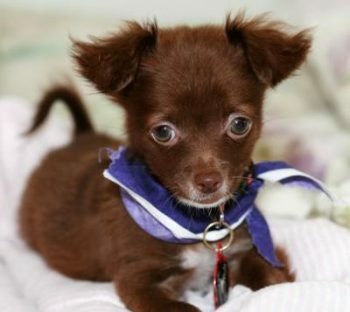 The coat of the Smooth Haired Chihuahua is very short, straight and glossy. The Longhaired Chihuahua sports a coat that is generally straight, although some have been known to have a wavy texture. Usually the Longhaired Chihuahua has an undercoat. The chest on the Longhaired Chihuahua is a white and fluffy mane, and this feathering extends to the legs, feet and tail. Despite its meagre size, the Chihuahua packs a hefty personality and courage to befit a dog triple his weight. The Chihuahua is intensely loyal, which makes him (if only in his mind) a splendid protector. The Chihuahua fancies himself to be king of his castle and other pets, particularly cats, need not apply. Chihuahuas need early socialization especially if other small creatures will be living within its domain. This rule applies especially to children who may think this tiny dog has a temperament to match. The Chihuahua has a reputation for being a saucy, sometime yippy pet. For this reason, the Chihuahua is better suited in homes without children. Conversely, some Chihuahuas are markedly timid and tremble at the mere suggestion of another animal. This trembling has also been linked to the fact that Chihuahuas are very susceptible to cold and to stress. The savvy Chihuahua owner will note that this trembling can also be an effective begging device. This trembling, when paired with a faint whimper, and limpid, melancholy eyes will render the owner powerless against surrendering the choicest bite of steak. Mercifully, the Longhaired Chihuahua tends to have a somewhat more mellow temperament. The temperament of your Chihuahua will depend on its parents, the breeder’s commitment to early socialization and your training. The Chihuahua always seems like he is in a great hurry; dashing from one place to the next, seemingly in search of something vitally important. This dance from room to room is actually all the exercise a Chihuahua needs. He does enjoy a short walk outside, but the Chihuahua cannot tolerate cold weather, and particularly when the walk involves icy sidewalks. The Chihuahua is a decidedly indoor dog. If the weather is agreeable, the Chihuahua will enjoy a romp in a fenced garden. He is a not a great fan of fetch or other games, but the Chihuahua can play along if you make it worth his while with a tasty treat. That being said, the Chihuahua is a notoriously finicky eater; if the food is unappealing, this breed will refuse to eat. The degree of grooming required by your Chihuahua depends on whether you have a Smooth Haired or Longhaired variety. If you had the grooming foresight to select the Smooth Chihuahua, your duties are minimal; an occasional brush and a monthly bath. Be sure to rinse all traces of shampoo from your Chihuahua, as even small traces of the residue can irritate his skin. Another bathing tip is to dry your Chihuahua carefully. His will likely run away hysterically from a hairdryer, but his tendency to get easily chilled means you should be attentive in your attempts to dry him thoroughly. On the other hand, the Longhaired Chihuahua will see a regular, more comprehensive grooming regime. The mane may need special attention as this area is prone to matting if not regularly brushed. This area may also have food remnants from when your Chihuahua last deemed the menu adequate. The tail and its feathering can retain memories of that menu also, so do be vigilant. The Chihuahua is a trainable pet, but are your patience is up to the task? The Chihuahua is a temperamental breed that will learn quickly and then be bored, so effective Chihuahua trainers move quickly through the process. And, try to train your Chihuahua before meals. Food is seldom an incentive for Chihuahuas and you stand a fighting chance only if your dog is hungry and the treat appeals to him. The most important tip is with respect to the leash and collar. 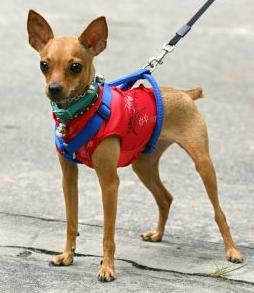 The Chihuahua is a small dog and a choke leash can easily damage the trachea of these dogs. Do not ever use a choke leash on these dogs. Instead, use a harness when training or walking. This next tip may feel like a setup, but its not. Because Chihuahuas are headstrong and stubborn, attempting to train him with militaristic commands will be doomed to failure. He will simply refuse and quickly lose interest. Instead, you demonstrate the acceptable action yourself (see what I mean?) and reward him amply with praise when he repeats this action. Don’t have your Chihuahua repeat the action or behaviour dozens of times; he’s got it. Keep the training sessions short and have fun. 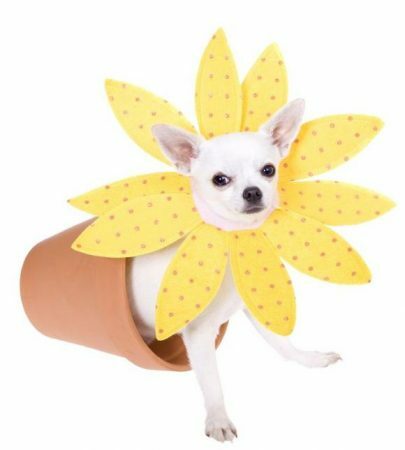 Finally, your Chihuahua will be immeasurably cute so don’t let his puppy antics cloud your vision of a well behaved pet. For a finicky eater, the Chihuahua can develop a refined taste for carpets, socks and most disturbingly, very expensive shoes. Clearly, training your Chihuahua early is a financial must. The Chihuahua has several health concerns related to its size. 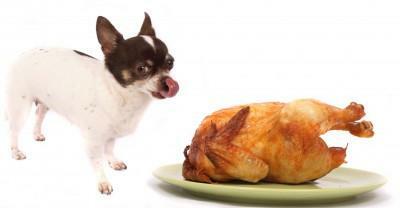 To begin with, Chihuahuas picky eating habits can lead to malnutrition. The old adage that children and pets will eat if they are hungry simply isn’t true for a Chihuahua. Their diets will need some coddling and you will need to have fresh, tasty morsels available several times daily. Leaving food to slowly crust over in a dish on the kitchen floor will simply not do. And, this is not just a matter of stubborn dog versus increasingly frustrated owner. A Chihuahua can suffer from hypoglycaemia and malnutrition if they refuse food for too long. Patellar luxation is a condition that can be mostly prevented if you prevent your Chihuahua from jumping onto beds, couches and the like. 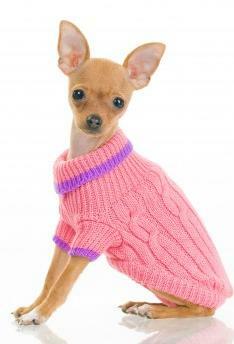 Because they are so small, Chihuahuas joints have difficulty absorbing the impact weight of its body. Try using doggy steps or some contraption designed for this purpose. Again, you will need to train your Chihuahua to use this apparatus. Interesting, some Chihuahuas have gluttonous tendencies and will gain weight quickly with high fat, and sugary foods (who can’t empathize with that?). Excess weight in Chihuahuas can lead to joint problems along with breathing difficulties and shortened life spans. Is a Chihuahua The Right Breed of Dog For You? The Chihuahua is a spirited and charming dog. His sassy and devilish personality will make a Chihuahua a marvellous pet and faithful companion. Perspective Chihuahua owners will welcome the minimal exercise needs and reasonable grooming. If, on the other hand, small children or other animals are current family members your intention is for both of them to stay, then the Chihuahua may not be the breed for you. Or, if you can foresee a time when pleading with your Chihuahua to ‘eat-his-medium-rare-beef-tenderloin-with-a-mushroom-reduction’ will not be pleasurable for you, then perhaps another breed is better. On the whole, Chihuahua owners report many years of companionship and high-strung fun. And, the Chihuahua’s loyal and charismatic personality will melt the heart of even the most reluctant puppy chef!